This tropical low dish arrangement is sure to make a good impression with it's beautiful purple dendrobium orchid blooms. This arrangement should last 7 - 10 days. 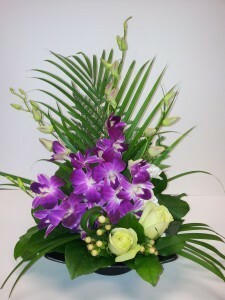 Purple dendrobiums may be substituted with white or green dendrobiums and rose colour may vary, depending on supply. Purplewhitegreen Dens Plus Complimentary Roses. 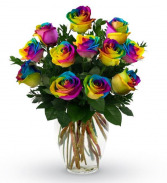 A Dozen Rainbow Dyed Roses, Hand Tied Bouquet Only, In A Vase, In A Vase With Babies Breath. A Felt Heart On A Pick, White Roses, Pink Orchid Bloom, Red White Mini Carns, Babys Breath, White Gerbs, Greenery. 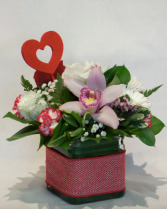 A Valentine's cube arrangement with Valentine's ribbon, a felt heart, and pink, red, and white flowers.